Tired of poor customer service? Tired of a poorly constructed product? 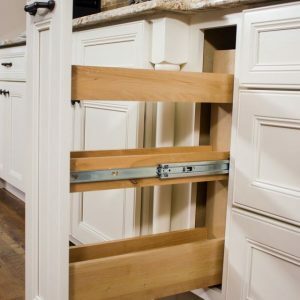 Tired of waiting weeks for your cabinets? ROC prides ourselves in providing exceptional customer service, lead time and guarantees customer satisfaction. Our all plywood cabinets are superior to anything else on the market. Our drawers are 50% deeper, our doors are 20% thicker and on our side panels are 25% thicker than other RTA cabinet lines. The cabinets are the easiest to assemble in the industry, ROC dovetails the face frame and the side panel, you simply slide them together, nothing could be easier. We also dovetail the bottom panel and back panel making assembly a breeze. ROC's dedicated team has hundreds of years of combined experience in cabinetry. YOUR SATISIFACTION IS OUR PRIORITY. ROC is in part owned by the factor. Most RTA lines order the same door style from several factories and that is why they don't offer a consistent product. 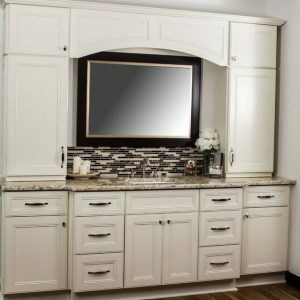 You've ordered cabinets in the past and saw that there was a few shades difference in the color, or the hardware was a little different, or the cabinet was constructed a little different. Time is money and when you have to wait on a door because it's a few shades different than the rest of the doors it cost you both time and money. 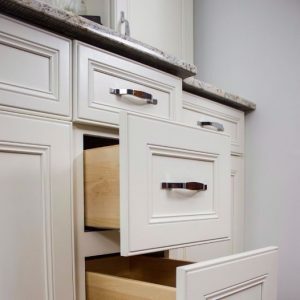 ROC Cabinetry warrants to the original purchaser that cabinetry, door hinges, and the drawer glides will be free from defects in material and workmanship under normal use and service for lifetime. This warranty is not transferable and only applicable to product used for res- idential purposes. Representatives of ROC Cabinetry do not have the authority to change or enlarge this warranty. This warranty does not cover normal wear and tear, damage or defects caused by accidents, misuse, abuse, or lack of necessary maintenance; nor does it cover alteration, modification, improper installa- tion, improper handling/ storage, environmental conditions, nor any labor expenses. 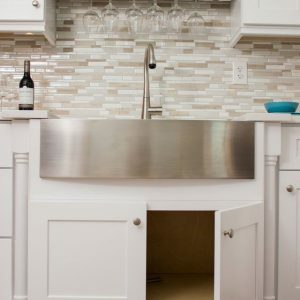 ROC Cabinetry has the option to elect to repair or replace with a functionally equivalent product. Some replacement parts are subject to availability and may differ from original parts received. Return of defective product may be required for a replacement to be issued. 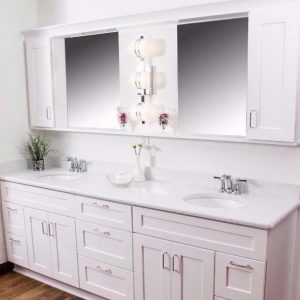 Repair parts or replacement parts are at the expense of ROC Cabinetry, but customer shall bear all other expenses. These ex- penses may include, but are not limited to, cost of removal and re-installation of product, labor ex- penses, etc. The variation in color and grain pattern in wood adds to its natural beauty and is not considered an imperfection. 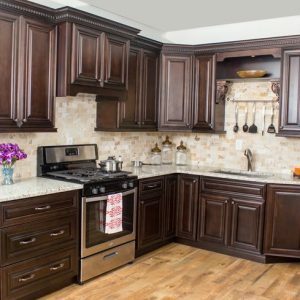 This warranty does not cover the environmental factors, including but not limited to arti- ficial/ natural light, moisture, cleaners, smoke, etc, may cause the darkening or mellowing of a cabinet over time. This is a natural process and can be expected. Low moisture can cause joints to open up. Some of the cabinet lines feature a glazed finish which accentuates the door and drawer front pro- files. This glaze is hand applied over a stain or paint and may, due to the nature of application, consist of random drips, runs, or may have variations in color and appearance from door to door and cabinet to cabinet. This is not considered a defect and is considered normal with hand applied finishes. It is the nature of wood to expand and contract to varying degrees depending on climate conditions. As a result, cabinet lines with painted surfaces may show fractures in the paint at joints. This is normal and is not considered a defect. This warranty is valid only in the United States of America and is not transferable. To the extent per- mitted by law, this warranty excludes special, incidental, or consequential damages. Some states do not allow the exclusion or limitations of incidental or consequential damages or limitations on how long an implied warranty lasts, so the above limitations or exclusions may not apply to you. This war- ranty gives you specific legal rights; you may have other rights which vary from state to state.